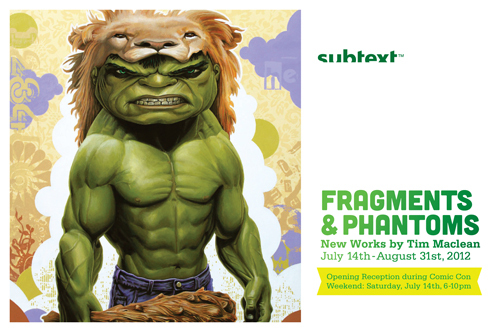 My solo show at Subtext Gallery in San Diego is just around the corner, so I just wanted to give a little update. The show dates I gave in an earlier post have been moved forward slightly, but the good news is that the shows running time has been extended as a result…. 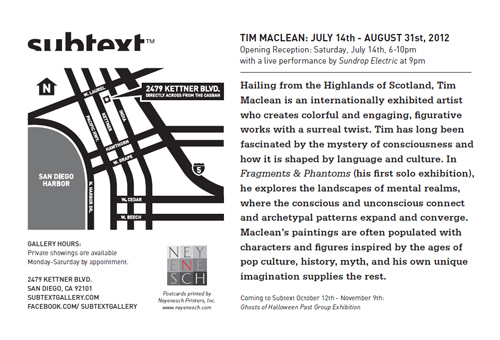 so it now opens on July 14th and runs through until August 31st. The opening coincides with San Diego’s Comic Con weekend, so it’ll give any of you pop culture junkies out there the chance of getting a second fix. Live music will also be provided on the night, courtesy of SD based band, Sundrop Electric. All the work has now been finished, varnished, framed and shipped to Subtext. There will be twenty original works in total (thirteen paintings and seven drawings), plus four limited edition giclee prints. I’m chuffed with how this body work has turned out and am very excited for you all to see it!